This is me rolling of happiness and joy. Not sure how I feel about 3 weeks of Halloween stuff. 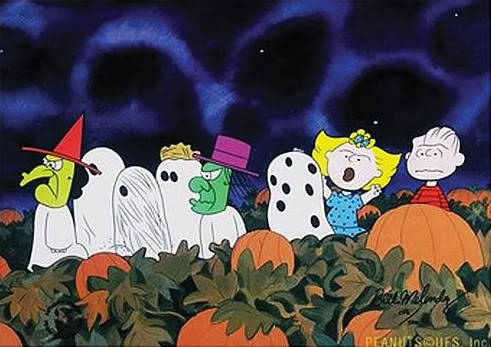 I wish that they would do a cute Halloween theme, like Charlie Brown. Not just the scary stuff. I used to dress as a princess for Halloween, and it was more like a masquerade ball. A Charley Brown theme would be great! I don't especially care for all the scary, spooky stuff. At least not 3 weeks of it. I wish they would come out with funny costumes, like we used to have when we were kids, the plastic costumes with the matching masks that went around one's head with elastic. It would be so much fun to have really childish like costumes (Batman, princesses, snoopy etc.) that so many of us remember having when we were growing up. The decorations are great, the cats and such, but I really want to see a ghost costume with all the holes in it or something that really brings back the days of nostalgia. That's the Halloween that I remember. I agree with you. A sheet with holes would be cute. Have you ever watched 'It's the Great Pumpkin, Charlie Brown', Luka? The costumes in that is what I mean. They are scary, but cute scary. I never watched Charlie Brown, but I agree that the costumes are cure scary.